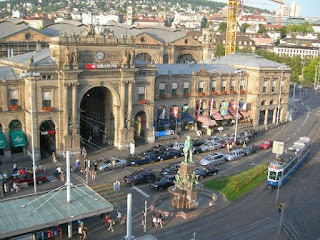 Our return trip from Greece to Germany had us fly into Zurich, Switzerland and drive the rest of the way home. And since it's right there, we stopped into Liechtenstein for dinner. It's pretty much just like another part of Switzerland as far as we could tell. We took a ferry out of Athens to Poros. It was very nice once we arrived. We drove through Sparta, totally hyped up to see the remnants of the legendary warrior culture. As legendary as Sparta is as a culture, they weren't really known for their architectural pursuits. Which is why the present-day ruins of ancient Sparta look kind of like an abandoned camping ground. That over there? That's Sparta, too. Right after I finished with all of the in-processing requirements from my second deployment, I hopped on the train to Zurich to meet up with Kacey, her aunt and her cousin. They left a couple of days ago, since they didn't have paperwork to do. The plan was for them to pick me up at the Zurich train station and we'd all head to the hotel. Well, wouldn't you know it, I arrived at rush-hour and it was raining. We had coordinated where at the station they'd pick me up and they already had my bags (I packed them in the car before they left), but there wasn't really a "pick-up/drop-off" area to get me into the car. So, I ended up sheltering under an awning near a traffic light until I saw their car, then I dashed across the side walk, hopped the guard rail and poured myself into the seat before the light turned red. And away we went. It was a short drive to the hotel where we had arranged for a park-and-fly rate so we could leave our car there while we're down in Greece. Ok, so my second deployment was back to the same base I went with Deployment #1, but I didn't get to go on any fun trips while I was here. So mostly, these are my pics from day trips downtown to Doha.